We received an online quote request this morning which prompted this post. A gentleman was looking for a price quote on 20 black t-shirts. He was providing the design which was unique and contained 14 different print colors. Since he didn’t have any exact knowledge how t-shirts are screen printed he was unaware of how cost prohibitive these shirts would be. So we broke the screen printing process down for him to explain the high pricing and what he could do to bring that cost down. There are a few factors involved in the pricing of a custom t-shirt order. 1. Quantity – the more shirts in an order the less each shirt cost. 3. Print location – is the order requiring a front print, front and back print, front and sleeve print, etc. These 4 factors determine price. How to lower cost on your custom t-shirts depends on your specs. If you have a small quantity of shirts you want to have very few print colors and print locations. The biggest factor when it comes to pricing custom t-shirts is the number of colors in the design. Each separate print color gets it’s own screen. Screen printing companies factor in a screen charge for each print color. Take for example a 24 black t-shirt order with a white and red front print. The white ink gets it’s own screen and the red ink as it’s own screen. Our screen charges are $15 for a standard screen. So this particular order would have $30 in screen charges. When you divide $30 by 24 shirts you get $1.25/per shirt going towards the screen cost. That’s cost effective. 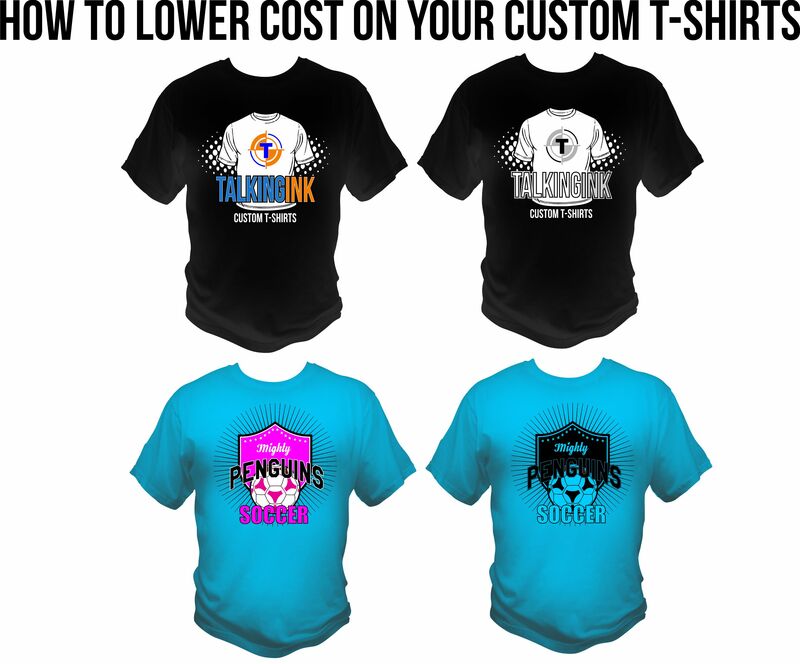 With the examples above, a great way on how to lower cost on your custom t-shirts is to eliminate colors. Many designs can be converted into a one color design to cut costs on lower quantities. We can also create half tones on single color designs which give the single color image more depth. The gentleman who sent in a quote request with a 12 color design figured like this. 14 colors equals 14 screens at $15/each for a total of $210.00 in screen charges. Take that $210 and divide it by the 20 black t-shirt he wanted to order. That breaks down to $10.50/shirt going towards screen charges. That’s before we even factor in shirt color and printing cost. So this would be a cost prohibitive order. how to lower cost on your custom t-shirts is done by keeping your print locations and print colors in line with your quantity. If you are ordering a small quantity of shirts you want to limit the design to a 1 or 2 color design and print locations to front only or a front and back print. The size of the design doesn’t factor into t-shirt pricing. It’s location and screens. So a dot of white ink that measure 1 inch by 1 inch costs the same as a square of white ink that’s 12 inches by 12 inches. It’s all the same setup and hence the same price. We say to keep shirts in the cost effective range you don’t want the cost of screens making up any more than $1.50 of your final per shirt price. Or go to our website and use our online quote form here.